It’s an easy verse but I think it is a small sermon. This is the kind of confidence I always want to have in God. That no matter the circumstance here on earth, we can trust that God is good. So good in fact, that our response is to praise Him. It’s a verse that could sound trite, but I pray it really cements itself in Lydia’s heart. Now, onto our craft. 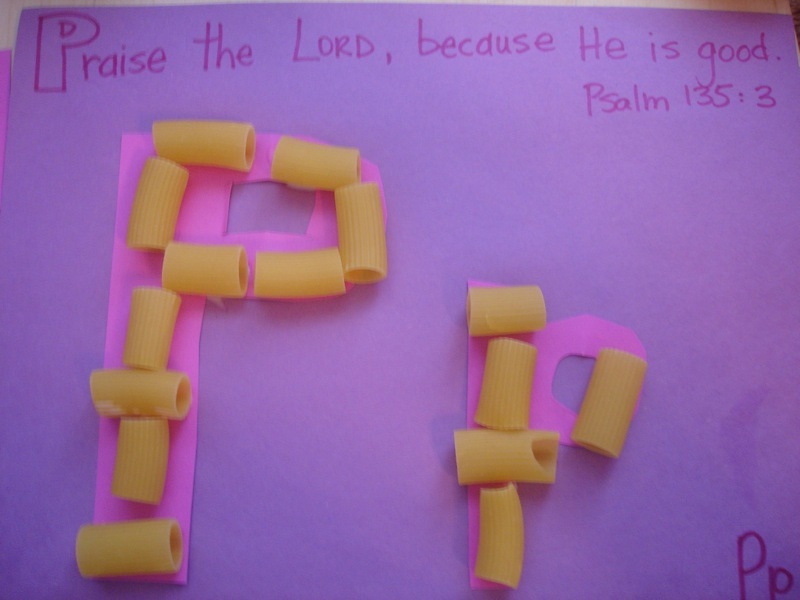 We ended up copying No Time For Flash Cards’ “P” craft a little and did some pasta P’s. I even used some pink & purple paper (although, I have to admit, it’s the only color I had!). 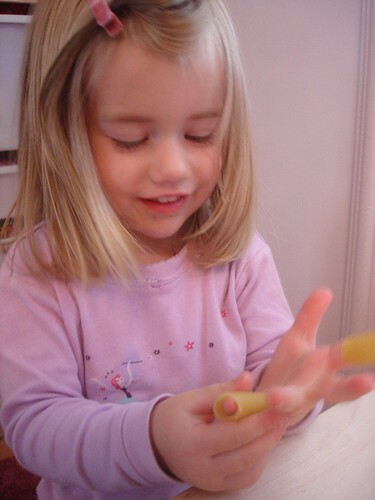 My daughter enjoyed this one so much we ended up making another pasta P.
Then we discovered 2 of our fingers started with “P”—pointer and pinky. So, we put pasta on our pointer and pinky and proceeded to sing, “Where is Thumbkin?” She’s eating lunch right now and has been singing it nonstop! 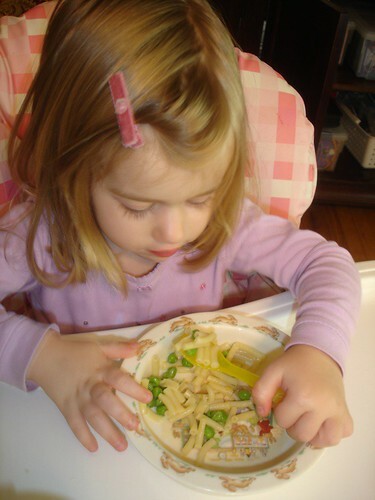 That’s right Pasta and Peas! How cute is this blog? It’s called Kiddio and is full of crafts, book reviews, etc. 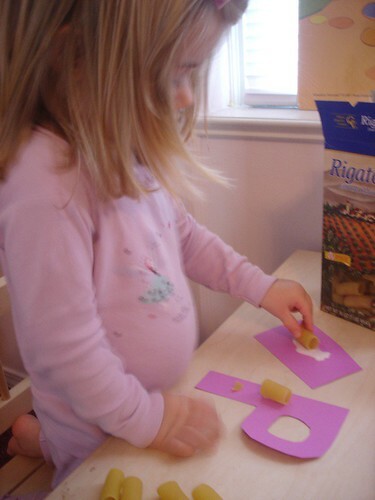 This one would be perfect for P—a book and an activity about PEAS! And oh, I want to do this! A Puppy Party with a cute cake, cute decor and the best is the doggy bag. I love it! I glanced through our books before naptime and found, Please Do Not Open This Book! which I think is just the 35th Anniversary book of The Monster at the End of this Book. It was one of my favorites as a kid and now Lydia loves to read it. It must say PLEASE and PAGES a hundred times. We read it today and said, “p-p-please” and “p-p-page” every time. She thought it was hysterical.